During the past few years, jewelers and jewelry lovers have embraced a back to nature trend. Jewelry has become a showcase for plant and animal designs, and for green themes in general. So it’s not a total shocker that jade jewelry has come back in vogue. Jade is an enchanting gemstone that comes in different hues and can be worn in many ways. 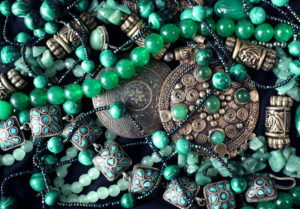 Jade has been used in Chinese culture for thousands of years. Ancient civilizations regarded it highly for ceremonial and ornamental purposes. Symbolically, jade represents virtue, purity, grace, and beauty. In traditional Chinese culture, women prize their jade bangles, sometimes not taking them off for months or years. The passing of a jade bangle from mother to daughter is a gift of love and a symbol of protection. Jade has long been cut in very particular, traditional ways. But newer designers have been breaking the mold. Dickson Yewn, a jeweler and artist, has said that he avoided the use of jade entirely early in his career because he thought the way jade was cut was not creative. These days, he’s embracing jade jewelry, but only when he can cut it to his preferences. Typically, you’ll find Yewn jade pieces cut into large, flat slabs, such as his pendant necklace with a flat slab of jade and smaller teardrops of jade descending from it. Yewn is best known for his jade ring from his Chinese Lattice collection. It features a rectangular slab of jade set on top of a latticed square shank. Former First Lady Michelle Obama wore the ring in 2011. Jade comes in all shades of green. But did you know there is also black jade? Lately, non-Asian brands like Cartier and De Grisogono have been embracing the use of black jade. It gives the jewelry a sophisticated edge and an ultra-modern look. The dark jade provides an excellent contrast when set against white gold and diamonds. Si Dian Jin is a traditional Chinese wedding custom. It translates to “four pieces of gold.” Traditionally, the groom’s mother gives the bride a four-piece set of wedding jewelry. The set includes a pair of earrings, a ring, bangle, and a necklace. Solid, yellow gold is the traditional material for a Si Dian Jin set. However, modern in-laws and brides have been migrating toward jewelry with a contemporary look. Jewelry designer Choo Yilin’s Si Dian Jin set only uses gold as an accent. The primary material is an exquisite smoky white, gray, or light green jade wrapped elegantly with delicate vines or flowers. At F. Silverman Jewelers, you’ll find fine and fashion jewelry in all colors and shades. From bangles and earrings to necklaces and engagement rings, we have it all. And if you’re shopping for a one-of-a-kind piece, just ask us about our custom jewelry. We can create unique jewelry for you based on your designs or ours. If you have questions, you can get in touch at (201) 930-8883. Or, stop by our shop in Bergen County, NJ to browse our selection.